I must say, though I liked Despicable Me a lot, I’ve been very surprised by the enduring popularity of the minions. They were slightly irritating in the films, though occasionally funny or cute or both. But through popular adulation or the power of forced marketing, they’re ubiquitous, especially in East Asia. In both Japan and Taiwan, there’s a profusion of soft toys of the things, even though I don’t think I’ve ever seen anything else relating to Despicable Me. So perhaps it made sense to give the minions their own vehicle, which box office numbers show certainly did draw more of an international audience than a new Despicable Me film would have. On the other hand, it’s extremely hard to shift focus fully onto comic relief without making a film with a strong smell of direct-to-video sequel. Minions does not manage to avoid this, at all. On the other hand, that doesn’t mean this isn’t an enjoyable and silly film, and it being set in London with a lot of familiar locations gave it bonus points for me. After a prologue showing minions attempting to serve evil figures throughout history, we find out that in the 60s, they were left bereft of a master or mistress. 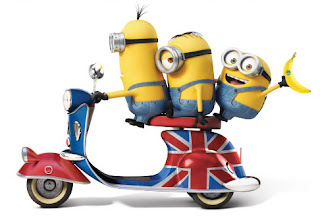 Thus, intrepid minions Kevin, Stuart and Bob set off to find the most despicable being on earth to serve. At a convention, they discover and win the affections of the wonderfully-named Scarlet Overkill, an American femme fatale with designs on the Crown of England. The plot as it unfolds is very silly and anything-goes, but that works just fine. But this film can’t hold a candle to Despicable Me or its satisfying sequel. The thing is, those films have a lot of heart, and the minions are just cute comic relief on the edge of that. This film, while fun and silly, is almost bereft of anything you could call heart. There’s no real emotional stakes here, and for that reason, everything stays superficial. That makes this a functional kids’ film that will keep the littlest ones entertained but nothing more.